Owners and lighting experts Anthony & Dorothy Anni, together, founded Cranberry Hill Lighting in 1970. Far from where they started, they both fell in love with the serenity of the Maine coast and landed in Cape Neddick. It was the perfect place to start and raise their family of five. Tony & Dottie, as they prefer to be known, share an extensive background in fine arts and lighting design. As any true collaboration, the two established a reputation based on their aesthetic for design, harmonious proportion, experienced craftsmanship and outstanding customer service. With a select collection of classic, transitional, and period lighting, as well as a blended mix of their own designs, Cranberry Hill Lighting has enjoyed considerable success. Tony & Dottie believe that a well chosen lamp should be seen as a piece of fine art, dramatically changing a room. A strategically directed source of light, will not only cast detail on the task at hand, but can add warmth and personality, texture and beauty. As a small but passionately, skilled team of artisans, Cranberry Hill Lighting, continues to practice this concept everyday. The Hill, as it is affectionately known, has spent the last 50 years expertly converting ceramics, antiques and decorative treasures into unique lamps, sconces and chandeliers. CHL is a unique, one of a kind lighting business. 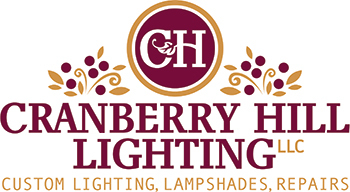 As a regular destination of both a loyal clientele, and members of the interior design community, Cranberry Hill Lighting has and will continue to create the perfect lighting solution for all their clients and customers. They continue to light the interiors and exteriors of many beautiful homes and businesses. As an interior designer or contractor, Cranberry Hill’s custom lighting services will give you the competitive edge that will set you apart from the competition. Commissioned, custom lighting, specifically designed to fit your client’s needs, will transform their homes and businesses. When it comes to lighting design, there is no substitute. Visit Cranberry Hill Lighting for an exceptional experience with a very personal touch. Visit our store or contact us today for a free consultation to discuss your needs and any ideas you have in mind. We are more than happy to work with you to create the perfect fixture for your home or business. Let us design a custom lampshade or lamp for you.